During May, intense Highs frequented the New Zealand region, alternating with some very deep Lows spawned out of the north Tasman Sea. The Highs favoured southern New Zealand, overall, resulting in a drier than usual May over the lower half of the South Island. Less than 20mm of rainfall was recorded during the month in Timaru and Oamaru. In contrast, the Lows produced several heavy rain events for the North Island and upper South Island. The most notable occurred on 11-12 May, (the remnants of Cyclone Donna), and 16-18 May. The first week of May was extremely cold, and temperatures lingered on ‘fairly ordinary’ after that. A significant cold outbreak on 19-20 May produced the first decent snowfall of the year. The High over southern New Zealand looks likely to linger during the first half of the month, give or take. The weather map will still have fronts and troughs on it during that time, but typically the rain makers won’t yield well over the South Island. In contrast, sporadic wet easterlies are likely to continue to affect the North Island for the first third, possibly half, of the month. “Once we hit mid-June, all indications are that we see a major shift in weather regime. Highs are predicted to change location, favouring a position over the Tasman Sea for the back half of the month,” commented Griffiths. This is forecast to produce a more traditional, mobile westerly pattern over the country. 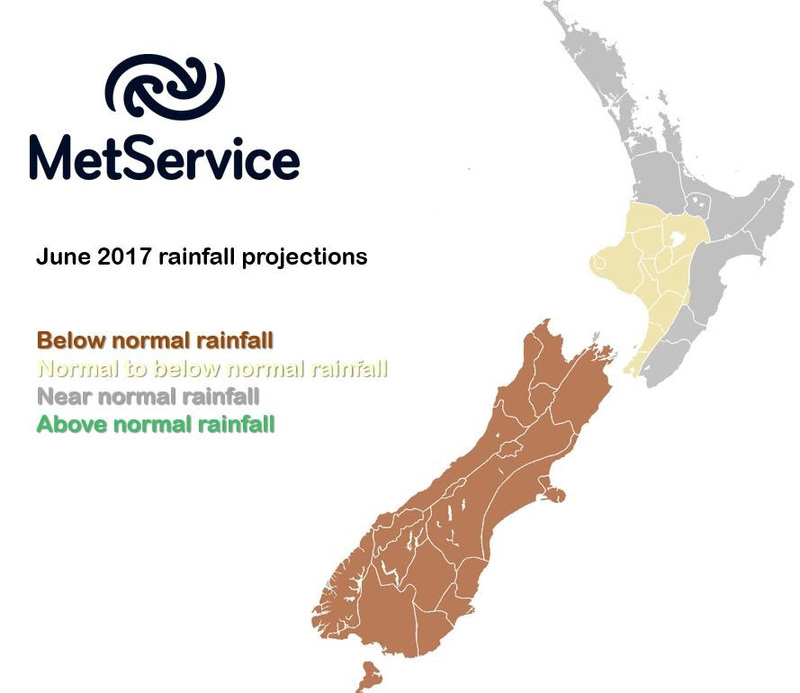 A drier than normal June is forecast for the South Island, and things look likely to run a touch drier than normal for the southwest of the North Island. Near normal totals are predicted for the north and east North Island. For the North Island, the first half of the month is forecast to run colder than usual, while the second half of June should run about average. For Nelson, Marlborough, Canterbury and Otago, expect large temperature swings during June, with the month ending up about average, overall. For the south and west South Island, a warmer than usual June is signalled.